The nervous system controls bodily function by gathering sensory input, integrating that information internally, and communicating proper motor output. The nervous system is the body’s main communication system; it gathers, synthesizes, and uses data from the environment. The most basic unit of the nervous system is the neuron, which serves as both a sensor and communicator of internal and external stimuli. The nervous system can be broken down into two major parts—the central nervous system and the peripheral nervous system. The central nervous system, the main data center of the body, includes the brain and spinal cord. The peripheral nervous system includes all of the neurons that sense and communicate data to the central nervous system. The peripheral nervous system can be further divided into the autonomic system, which regulates involuntary actions, and the somatic system, which controls voluntary actions. central nervous system: In vertebrates, the part of the nervous system comprising the brain, brainstem, and spinal cord. peripheral nervous system: The part of the nervous system comprising a large system of nerves that are linked to the brain and spinal cord; this system is divided into the autonomic and somatic nervous systems. neuron: A cell of the nervous system, which conducts nerve impulses; consisting of an axon and several dendrites. Neurons are connected by synapses. innervate: To supply nerves to a tissue. The nervous system allows organisms to sense, organize, and react to information in the environment. The basic unit of the nervous system is the neuron. Synapses form between the neurons, allowing them to communicate to other neurons or other systems in the body. The general flow of information is that the peripheral nervous system (PNS) takes in information through sensory neurons, then sends it to the central nervous system (CNS) to be processed. After processing, the CNS “tells” the PNS what to do—what muscles to flex, whether the lungs need more oxygen, which limbs need more blood, any number of biological processes—and the PNS makes it happen through muscle control. The neurons responsible for taking information to the CNS are known as afferent neurons, while the neurons that carry the responses from the CNS to the PNS are known as efferent neurons. The human nervous system: The nervous system of the human body, including the brain and spinal cord (central nervous system) and all the nerves of the body (peripheral nervous system). The nervous system can be divided into two major parts—the central nervous system (CNS) and the peripheral nervous system (PNS). The central nervous system includes the spinal cord and the brain. The brain is the body’s main control center. The main function of the CNS is the integration and processing of sensory information. It synthesizes sensory input to compute an appropriate motor response, or output. The peripheral nervous system includes a large system of nerves that are linked to the brain and spinal cord. It is comprised of sensory receptors, which process changes in internal and external stimuli and communicate that information to the CNS. The PNS can be further subdivided into the autonomic nervous system and the somatic nervous system. The autonomic nervous system regulates involuntary actions such as internal-organ function and blood-vessel movement. It supplies nerves to (“innervates”) cardiac and smooth muscle tissue. The autonomic nervous system is made of two components, which work in opposition to one another: the sympathetic nervous system, responsible for the body’s “fight-or-flight” response to danger, and the parasympathetic nervous system, which calms the body back down. The somatic nervous system controls voluntary movements such as those in the skin, bones, joints, and skeletal muscles. Both of these systems within the PNS work together with the CNS to regulate bodily function and provide reactions to external stimuli. The central nervous system is made up of the brain and spinal cord, which process sensory input and provide instructions to the body. The central nervous system (CNS) and the peripheral nervous system (PNS) comprise the entirety of the body’s nervous system, which regulates and maintains its most basic functions. The CNS is the main control center of the body—it takes in sensory information, organizes and synthesizes this input, then provides instructions for motor output to the rest of the body. The CNS is made up of the brain and spinal cord. The brain is the main data center of the body, consisting of the cerebrum (which regulates higher-level functioning such as thought) and the cerebellum (which maintains coordination). The brain stem includes the midbrain, pons, and medulla, and controls lower-level functioning such as respiration and digestion. The spinal cord connects the brain and the body’s main receptors, and serves as a conduit for sensory input and motor output. cerebrum: In humans it is the largest part of the brain and is the seat of motor and sensory functions, as well as the higher mental functions such as consciousness, thought, reason, emotion, and memory. spinal cord: A thick, whitish cord of nerve tissue that is a major part of the central nervous system. It extends from the brain stem through the spine, with nerves branching off to various parts of the body. cerebellum: Part of the hindbrain in vertebrates. In humans it lies between the brainstem and the cerebrum, and plays an important role in sensory perception, motor output, balance, and posture. The central nervous system (CNS) is one of the two major subdivisions of the nervous system. The CNS includes the brain and spinal cord, which together comprise the body’s main control center. Together with the peripheral nervous system (PNS), the CNS performs fundamental functions that contribute to an organism’s life and behavior. The nervous system has three main functions: gathering sensory information from external stimuli, synthesizing that information, and responding to those stimuli. The CNS is mainly devoted to the “information synthesizing” function. During this step in the process, the brain and spinal cord decide on appropriate motor output, which is computed based on the type of sensory input. The CNS regulates everything from organ function to high-level thought to purposeful body movement. Thus, the CNS is commonly thought of as the control center of the body. The CNS is comprised of the brain, brain stem, and spinal cord. The central nervous system: The three major components of the central nervous system: 1) the brain, 2) brain stem, and 3) spinal cord. the temporal lobe, which controls hearing and some other speech functions. The cerebellum is located underneath the backside of the cerebrum, and governs balance and fine motor movements. Its main function is maintaining coordination throughout the body. The brain stem is connected to the underside of the brain. It consists of the midbrain, pons, and medulla. The midbrain is found in between the hindbrain and the forebrain. It regulates motor function and allows motor and sensory information to pass from the brain to the rest of the body. The pons houses the control centers for respiration and inhibitory functions. The medulla also helps regulate respiration, as well as cardiovascular and digestive functioning. The spinal cord connects the brain and brain stem to all of the major nerves in the body. Spinal nerves originate from the spinal cord and control the functions of the rest of the body. Impulses are sent from receptors through the spinal cord to the brain, where they are processed and synthesized into instructions for the rest of the body. This data is then sent back through the spinal cord to muscles and glands for motor output. The peripheral nervous system connects the central nervous system to environmental stimuli to gather sensory input and create motor output. The peripheral nervous system (PNS) provides the connection between internal or external stimuli and the central nervous system to allow the body to respond to its environment. The PNS is made up of different kinds of neurons, or nerve cells, which communicate with each other through electric signaling and neurotransmitters. The PNS can be broken down into two systems: the autonomic nervous system, which regulates involuntary actions such as breathing and digestion, and the somatic nervous system, which governs voluntary action and body reflexes. The autonomic nervous system has two complementary parts: the sympathetic nervous system, which activates the “fight-or-flight-or-freeze” stress response, and the parasympathetic nervous system, which reacts with the “rest-and-digest” response after stress. The somatic nervous system coordinates voluntary physical action. It is also responsible for our reflexes, which do not require brain input. afferent: Leading toward the central nervous system. efferent: Leading away from the central nervous system. polysynaptic reflex: Involves at least one interneuron between the sensory and motor neurons. monosynaptic reflex: Involves a single synapse between the sensory neuron that receives the information and the motor neuron that responds. somatic nervous system: The part of the peripheral nervous system that transmits signals from the central nervous system to skeletal muscle and from receptors of external stimuli to the central nervous system, thereby mediating sight, hearing, and touch. autonomic nervous system: The part of the nervous system that regulates the involuntary activity of the heart, intestines, and glands, including digestion, respiration, perspiration, metabolism, and blood-pressure modulation. sympathetic nervous system: The part of the autonomic nervous system that raises blood pressure and heart rate, constricts blood vessels, and dilates the pupils in situations of stress. parasympathetic nervous system: One of the divisions of the autonomic nervous system; located between the brain and the spinal cord; slows the heart and relaxes the muscles. 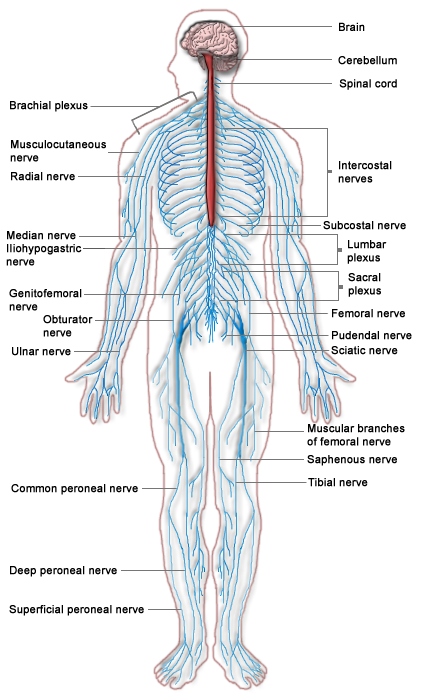 The peripheral nervous system (PNS) is one of the two major components of the body’s nervous system. In conjunction with the central nervous system (CNS), the PNS coordinates action and responses by sending signals from one part of the body to another. The CNS includes the brain, brain stem, and spinal cord, while the PNS includes all other sensory neurons, clusters of neurons called ganglia, and connector neurons that attach to the CNS and other neurons. The nervous system: The human nervous system, including both the central nervous system (in red: brain, brain stem, and spinal cord) and the peripheral nervous system (in blue: all other neurons and receptors). The PNS can also be divided into two separate systems: the autonomic nervous system and the somatic nervous system. The autonomic nervous system regulates involuntary and unconscious actions, such as internal-organ function, breathing, digestion, and heartbeat. This system consists of two complementary parts: the sympathetic and parasympathetic systems. Both divisions work without conscious effort and have similar nerve pathways, but they generally have opposite effects on target tissues. The sympathetic nervous system activates the “fight or flight” response under sudden or stressful circumstances, such as taking an exam or seeing a bear. It increases physical arousal levels, raising the heart and breathing rates and dilating the pupils, as it prepares the body to run or confront danger. These are not the only two options; “fight or flight” is perhaps better phrased as “fight or flight or freeze,” where in the third option the body stiffens and action cannot be taken. This is an autonomic response that occurs in animals and humans; it is a survival mechanism thought to be related to playing dead when attacked by a predator. Post-traumatic stress disorder (PTSD) can result when a human experiences this “fight or flight or freeze” mode with great intensity or for large amounts of time. The parasympathetic nervous system activates a “rest and digest” or “feed and breed” response after these stressful events, which conserves energy and replenishes the system. It reduces bodily arousal, slowing the heartbeat and breathing rate. Together, these two systems maintain homeostasis within the body: one priming the body for action, and the other repairing the body afterward. The somatic nervous system keeps the body adept and coordinated, both through reflexes and voluntary action. The somatic nervous system controls systems in areas as diverse as the skin, bones, joints, and skeletal muscles. Afferent fibers, or nerves that receive information from external stimuli, carry sensory information through pathways that connect the skin and skeletal muscles to the CNS for processing. The information is then sent back via efferent nerves, or nerves that carry instructions from the CNS, back through the somatic system. These instructions go to neuromuscular junctions—the interfaces between neurons and muscles—for motor output. The somatic system also provides us with reflexes, which are automatic and do not require input or integration from the brain to perform. Reflexes can be categorized as either monosynaptic or polysynaptic based on the reflex arc used to perform the function. Monosynaptic reflex arcs, such as the knee-jerk reflex, have only a single synapse between the sensory neuron that receives the information and the motor neuron that responds. Polysynaptic reflex arcs, by contrast, have at least one interneuron between the sensory neuron and the motor neuron. An example of a polysynaptic reflex arc is seen when a person steps on a tack—in response, their body must pull that foot up while simultaneously transferring balance to the other leg.